We’ve been working with the bookies to bring you all the latest enhanced odds. The list immediately below shows betting offers today across all the main sporting events. There are a lot of new offers available at the moment, please scroll down to see them all! Up to 100% bonus on winning football accumulators! SUPER HIGH ROLLER - available until end of Premier League season! £1,000 Premier League Free Bet! New customers only. Offer expires at the end of the Premier League. Free bets credited once deposit of £5000 has been turned over 3x at min odds of 1.8 to get free bet. Max free bet £1,000. Turnover requirement of free bet is 1x the free bet value within 7 days of receipt at the minimum odds of 1.8 on Premier League football markets only. 18+, begambleaware.org. Full T&Cs apply. New Customers only - £10 minimum deposit using promo code "10FREE" - First bet must be placed on any market - Minimum stake £10 at odds of 1/2 (1.5) - Free bets are credited upon qualifying bet settlement and expire after 7 days and full T&C's apply. Betfred sign up offer - Bet £10, Get £30 in free bets + 30 free spins! Betfair Sportsbook - Get up to £100 in free bets! As an offer for a new customer they are similar to free bets, but the main difference is that they are not guaranteed. And that’s the trade off. You’ll usually get better value for your money, but there’s always a small risk that you won’t actually win. So in addition to enhanced odds offers, it is prudent to consider what your options are. Different offers suit different budgets and some people have differing approaches to risk, it’s important to do what is right for you. Elsewhere on this page you will find the standard free bets and bonuses available to allow you to easily compare the options. Which bookmakers offer enhanced odds? Not all bookies offer these enhanced odds, but we cover the majority of those that do. All the bookies featured on the site are established, secure and trusted brands that have been operating for a significant length of time. You may note that we do not feature hundreds of little-known bookmakers like a lot of other sites, this is so you can be sure that you are going to be treated fairly when you sign up. We feature all the current enhanced odds offers from these bookies across a range of sports. The majority of these are football odds, with the Premier League being the competition featured the most. You’ll also see betting offers for the FA Cup, Champions League, League Cup etc, we’ll post these in the days leading up to the appropriate fixtures. Lately the bookies have been featuring a lot of enhanced accumulators, we’ve seen some enormous prices on just 3 team trebles, so keep an eye out for more of these. Remember that the very nature of enhanced betting means that the offers are often short-lived. The bookmakers will often only publish the increased odds in the last couple of days leading up to a game. In fact, some of the best enhanced odds can be found in the hours leading up to kick off. So bookmark the site and be sure to check back often for all the best deals! Who’s in the Enhanced Bets hall of fame so far this year then? The list below shows the top bookies for enhanced odds, taking into account a number of factors. We’ve considered both the quantity AND quality of their odds, their originality and their general appeal to you the punter. Due to the relentless consistency with which we’ve been able to offer quality Betfair enhanced odds to you, they take the number one spot. By providing regular ongoing sign up offers and Betfair enhanced specials, they have also cemented their place as a firm favourite with our visitors. Paddy Power are a close second with hugely competitive prices and a reputation for both good fun and high quality customer service. Coral complete a close run top 3, their “Brazil to wear yellow” offer was a massive hit with our visitors. As a clarification, the list below also includes bookies that have these offers on a regular basis for their existing customers. For example, although we don’t regularly have William Hill enhanced odds on our homepage, they are a bookie that gives extra value to their customers with continual regular offers. 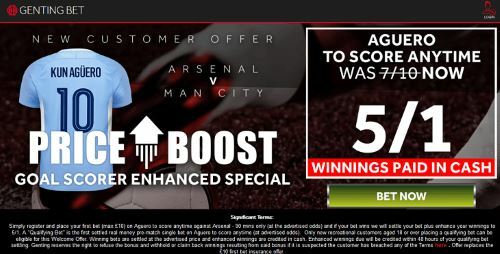 In addition to all the short-lived enhanced odds and specials on offer, we also detail the available new customer offers that can be used when joining a new bookmaker. These are typically the bread and butter type offers that are available week in week out. As you probably know, whenever you sign up with a new company you can take advantage of their current free bet (sometimes a promo code is needed to claim it) as an incentive and to help get you started. The top betting offers are shown just above, and the best of the rest can be found in our review section or via the search box. Both the free bets and the associated promotion codes do change from time to time, generally as the bookies adjust their offers whilst vying for your custom! If you want to know when a new one goes live, you can join our alerts mail out – see below for details. If you don’t have time to check the site regularly, why not subscribe to our enhanced odds alert service? We’ll email you all the latest bets as soon as they go live on the site, so you can be sure you never miss an offer! You can find a link to our email alert service at the bottom of the page.